It’s finally swimming season! Perhaps the only thing more luxurious than lounging by the pool at some tropical resort is knowing that a beverage, suntan lotion, magazine or a snack, are just a few short steps away. Although a pool house might seem like an extravagant thing to build, the best pool house designs can create the illusion of having a vacation resort in your own back yard. Because there’s nothing like the freedom of taking a vacation whenever you want one, all while enjoying the comforts of your own home. The primary purpose of great pool house designs are to provide a private space near the pool to change in and out of swimsuits, go to the bathroom, shower, take a nap, enjoy a beverage, and entertain friends or family. But it can do a lot more than that. Let’s discuss the 3 biggest benefits of the best pool house designs. If you own a pool, chances are you’ll be entertaining guests at some point. A pool house allows you to keep the party outside, in your backyard, rather than inside your home. Since everything is available poolside, guests won’t need to enter your home to use the bathroom or to get food and drinks. Never again having to worry about guests running in and out of the house, leaving a trail of wet footprints behind as they move about your home is a huge plus. In fact, if you choose to invest in a pool house with a bathroom and kitchen area, there’s really no need for anyone to enter your home at all. Being able to entertain guests outside is the primary factor clients routinely say they love having a pool house. It gives you the freedom to throw great summer parties without the drawback of having lots of wet people moving about your home. A pool house makes summers more enjoyable by having everything you need just a few short steps from the pool. This can range from a well appointed shed to a sizable guest house complete with bathroom and kitchen facilities, a sitting area, bar, and even bedrooms. Many pool houses feature a covered patio area with tv’s and outdoor furniture to lounge in and get some shade. 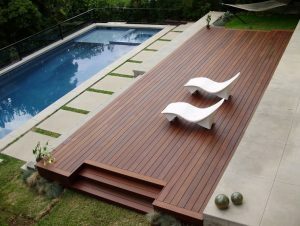 Great pool houses become an outdoor entertainment, extensions of your main patio or deck. Adding an outdoor kitchen or a lounge surrounding a fireplace makes the pool house that much more of a desirable destination. Pool houses are great places for storing pool and spa equipment. As well as for hiding the fairly large yet necessary pool pumps and filters. Bigger pool houses can include storage space for storing pool toys and all sorts of maintenance supplies. If big enough, you could even house pumps, filters, and other essential pool equipment inside. If designed right, pool house can be much more than a simple storage shed designed to house your pool stuff. You probably use chemicals to clean the pool and balance it’s water composition. These chemicals can potentially be dangerous, best securely locked away in a pool house where they can’t be accidentally ingested or improperly used. This is a huge benefit for families with small children or pets who can rummage through cabinets getting themselves into trouble. Whenever you do any type of home improvement or consider buying a new home, thinking about resale value is a good idea. While honestly, pools are hit or miss in terms of adding resale value here at the Jersey Shore, pool houses are a sure thing. On the low to mid end of real estate prices, a pool can sometimes be a bad thing. For a variety of reasons, home buyers on average, don’t want to pay a premium for homes with a pool. If your considering putting one in or buying a home with one already installed, do your homework first. You may be throwing some of your well earned money away. All this changes however if you factor in a pool house. They add value to a home no matter what price point your at. Home buyers love having the extra space and outdoor storage. And any amenity you add is always a plus. Almost no one dislikes having an outdoor shower, bathroom, patio area, bar, kitchen, etc. Some of you may already be thinking that a refreshing pool would be a luxury in itself. A pool house is an even more remote dream considering how expensive a pool can be. But we’re allowed to dream aren’t we. A fabulous Mediterranean inspired pool house like the one shown above is definitely not just a simple home addition that just fills space in your backyard. 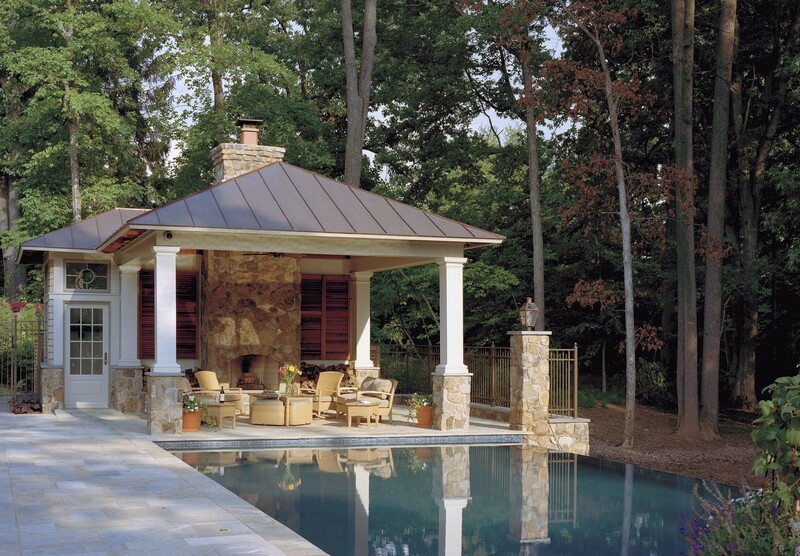 The best pool house designs perfectly compliment the look of the main home while providing both form and function. A one stop shop for all your outdoor lounging needs and obviously makes hosting a cool pool party a whole lot easier. A pool house design open to the elements is great if you’re focused on having more entertaining space. Keeping the sides open allows you a constant view of the pool and an indoor outdoor feel. This design is perfect if you’re on a budget since open areas are cheaper to build than enclosed ones. There’s no doubting the fact that a pool house has always been considered a symbol of luxury. A classic pool house design perfectly highlights this idea, elegantly bringing to life that picture perfect holiday postcard image. With classic lines and materials such as wood and stone being beautifully put together, this pool house paints a picture of tradition and opulence. While these pool houses look fantastic, remember that they should be paired with a matching style home. If your pool house plans are small, don’t worry. There are tons you can do with a small amount of space, while still ending up with a great, functional pool house. Though somewhat limited to what you can do by such a small area to work with, you can still squeeze in everything you need. Glass doors will also open up a small space, as will cleverly thought out furnishings. Consider adding a covered patio since these are cheaper to build than fully enclosed spaces. Going beyond the simple aesthetics, let’s look at the practical aspects of top pool house designs. For starters, consider the available space, the size of the pool, the yard, and the main house. Your pool house should be in proportion with everything around it. It’s probably not a good idea to build a 2000 sq. ft. pool house if your home is 2000 sq. ft., but if your home is 20,000 then a large pool house may be the appropriate size. If you’ve got the space consider a design that offers both enclosed and open lounging areas. When it comes to the best modern pool house plans. The best are always the ones that have the most flushed out designs which can benefit daily life. Here, you have ample areas designated for cooking, eating, lounging, and just hanging out. And with an open floor plan, everything flows together beautifully. When it comes to your own creative pool house ideas, make sure to create areas dedicated to whatever activities you like to do outdoors. A contemporary pool house can be more than just a place to stash all your pool gear, extra towels and outdoor stuff. It’s a space where the entire family can rest and rejuvenate while enjoying the pool and sunshine. Comfy outdoor décor, a cool couch, some chairs and a coffee table can create the perfect sitting area, with an additional dining area turning the pool house into a secondary living space. Clean lines and smart modern design that complements the main house in its contemporary style ensure that the pool house integrates easily with the overall landscape. Once summer has arrived full force in New Jersey, we don’t have much of a choice but to spend the majority of our time outside swimming. Be it at a river, ocean or private pool, water and a grill are vital parts of any summer at the Jersey Shore. That said, when I think of the ultimate in poolside lounging, nothing quite tops the luxury of a lavish pool house. This modern dreamy bungalow make it possible to host a pool party without ever having to set a wet foot in the house. All while providing a cool space for friends and family to beat the heat. Elements such as a guest room, bathroom, showers, kitchen, grilling station or sitting areas are all features found in top pool house designs. Make sure to include lots of room for storage and plan for private areas where guests can lounge and feel at home. Remember that a pool house should complement, not compete, with the main residence. Notice the small pool house shown above. 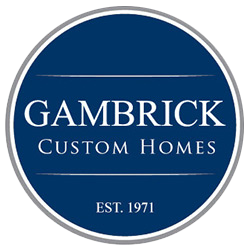 It’s design compliments the style of the main home and the size is kept in perfect proportion. You don’t want the pool house to over power your home, yard, patio, deck, pool, etc. Everything must work together as one cohesive unit. Your pool and spa house can provide an area to store your pool equipment, a convenient place to entertain, and a way to bring the amenities of your home outside. Parties are half the fun of having a pool house. Make sure to add lots of comfortable seating, cocktail or coffee tables and, if you like, an outdoor kitchen area. Choose stylish outdoor fabrics and other waterproof surfaces. Make sure whatever you choose it’s comfortable when wet. Recessed wall and floor lighting create the perfect atmosphere for entertaining at night. If you have to walk back and forth from your home to fetch cold drinks and fresh towels, that defeats the point of all great pool house designs. Stock yours with a mini fridge, snacks, dishware, extra towels and other necessities. Add a small bathroom area with a toilet, sink and shower so that guests can rinse off as soon as they get out of the water. A quaint little country cottage at the end your garden next to the pool is one of the coziest pool house designs we can think of. This is a great idea if you’re thinking of pool house plans with living quarters for guests to stay in. Make it feel like a home away from home for guests by introducing warm, comforting color schemes into your pool house plans. And just think about how colorful flower beds surrounding your pool and pool house will look for a stunning country cottage feel. Take your pool to the Mediterranean with stucco, terracotta tiles and lots of plants. A Mediterranean style with a modern twist is a great look for a top pool house design. Having a pool house connected to the main house is also a great feature. You can open it all up when it’s just you and the family at home or close the pool house off when you want to keep the party outside. To design your dream pool house, you need to know what style you want your pool house design to be. First, we suggest you make a list of exactly what you’re going to be using it for. Do you need a changing area? Maybe an extra guest bedroom away from the main home? A bathroom? An entertaining area? Maybe even a bar? Pool houses are often used as guest houses too, so thoughtfully chosen and placed furnishings are vital to creating a comfortable living space. Remember top pool house designs are all about function, so start designing there first. Guests changing into their swimsuits will want some privacy. If you don’t want them changing into and out of their wet swimsuits add a changing area. If you’ve got a small pool house design keep it simple. Just a room to change in will generally be enough. Add a bathroom with shower if you’ve got the space and budget but the bare essentials are all you really need. Unlike your main home, a pool house can be as large or small as you’d like. This freedom can lead to many newly inspired design decisions. You can use your pool house designs to create a new style from the main home while ensuring that it brilliantly compliments your pool. And if you’re lucky enough to have ample space, you may be able to include elements you’d normally have to go into the main house to use, like bathrooms, showers, a kitchen or dining areas. Note how the pool house featured above is just the right size for the scale of the pool it edges while boasting enough space to work as a covered sitting area and guest suite. We also suggest you take note of how the exterior of the pool house compliments the materials used in the walkway and retaining wall. The use of stone, metals and square columns is a beautifully sophisticated look. Following your home’s architecture is a good rule of thumb. Your pool house doesn’t have to match your home exactly, but it shouldn’t feel mismatched. Be sure its style, lines and proportions complement those of the main house. As you can see above the main house is stone while the pool house is stucco, the roofing shingles are different and so is the roof line. But the colors flow together perfectly along with the colors of the patio and retaining walls. If you’re lucky enough to have a pool and space for a pool house, you’re already envied the world over. So why not go for the gold and build a stunning pool house like the one shown above? An absolutely stunning pool house design that’s both an elegant yet functional addition to the main home. Which is also an architectural masterpiece. Take note of how the styles and materials used all flow together perfectly while not being exactly the same, which is a great thing. Take the opportunity when designing a pool house to add some extra oomph to your backyard by being creative.